I may regret putting my own senior portrait on the internet but for the sake of the upcoming senior class I hope by sharing this, they don't make the same mistake I did. THIS was my best senior portrait. My slightly-cubby-teenage cheeks, a standard set of fake pearls, this weirdly- centered composition in a sterile & boring studio setup, & finally a zero-personality-fake-smile - yep this my BEST shot. I still cringe looking back at it, enough that it has stayed hidden in a box for the past 12 years only to see the light of day for this post. So Seniors, do as I say, not as I do, GO get your portraits taken by someone who can capture your personality & truly celebrate the person you have become through the ups and downs of your high school journey. 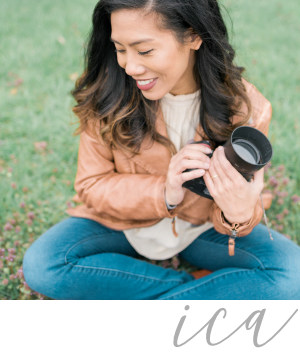 Whether it's through Ica Images or another local photographer, go invest in portraits you can be proud of for years to come. Maybe 12 years from now, once you're married & moved out of mom & dad's house, you'll still love your photos enough to hang them up on your walls. I can't say the same for myself. Because of my own embarrassing senior portraits, I want to help celebrate & capture the class of 2018 by hosting my biggest portrait sale ever, making sure they won't leave with photos they'll bury & hide for the rest of their lives!!! Class of 2018, I can't wait to celebrate YOU! Please fill out the contact for below or email me at ica@images.com for more information. Are you a parent or student? A parent of a 2018 senior A 2018 senior! WOOHOO!! Thank you & I'll be in touch soon! We have lived on opposite coasts for all of our lives, but times they are a changin'! My California bestie, Reinna is now living on the East Coast a few states south of me & she's very pregnant. The last time we saw each other was so early on in her pregnancy that I didn't get to see her beautiful baby bump in all it's glory. So this month my family & I took a trip down to see her and Christian, her husband. Here are some photos of Rein & her 3rd trimester bump on the streets of downtown Wilmington & Wrightsville beach. Rein, I love you, Chris and that baby boy growing inside you, so much! This southern Maryland sweetheart is so kindhearted & so poised. I know you are going to do some incredible things in your lifetime, Elizabeth. I'm grateful to catch just a piece of your journey & celebrate the amazing young woman you are right now!